According to the Hollywood Reporter, Warner Bros. is introducing a novel way for you to get your hands on movies previously unavailable on DVDs. Just go to WarnerArchive.com, look through their library, purchase a film for $19.95 and they’ll burn and ship the DVD to you in about 5 days. I browsed through some of the titles and didn’t see anything I was dying to buy but this idea got me thinking. What if all the studios opened their vaults like this and gave consumers access to not only unreleased movies but TV shows, too? Is there anything I’d want? Hell, yeah. First titles that came to mind were The Bionic Woman and The Six Million Dollar Man complete series. I know that’s nerdy but I grew up addicted to those shows and I idolized the supercool, kickass Lindsay Wagner. The holdup is some complicated copyright issue (Universal owns the series but the shows were based on a book called Cyborg, which Universal doesn’t own) but man, if the studio ever gives me access to this, I’d dash off an order so fast and even splurge for overnight shipping. I’d probably also order Song of the South from Disney. 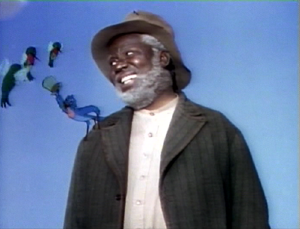 I loved Uncle Remus zip-a-dee-do-dahing along with a blue bird on his shoulder and I hate that I haven’t been able to see it again in my adult years. Does this idea of customized DVDs sound interesting to you? What rare or obscure title would you order if you suddenly had access to any movie/TV show you wanted? Let me know in the comments section! I hadn’t heard about this. Guess WBros needs some cash and are cashing in. Yes, you ARE very NERDY to want the Bionic Woman and Six Million Dollar Man episodes on DVD. I got the heads up the other day they were going to do this and already started browsing. Don’t think you’ll ever get hold of Song Of The South. Too much controversy. There’s a series from my misspent youth I think of from time to time, but I don’t even remember the title. It was very much like The Monkees. But they had odd super powers AND played in a band. I think it was called Bananas? No clue. You had the entire Banana Splits collection? Dang! Somebody would probably pay hundreds for that on eBay. Do you still remember the show’s theme song? I’ve got it stuck in my head now. And Jaime did have a cool place. Ha ha! I guess OSI agents made good coin! Okay, kids, NOT the Banana Splits. I wasn’t that much of a geek in my youth.